Yarr, me hearties! 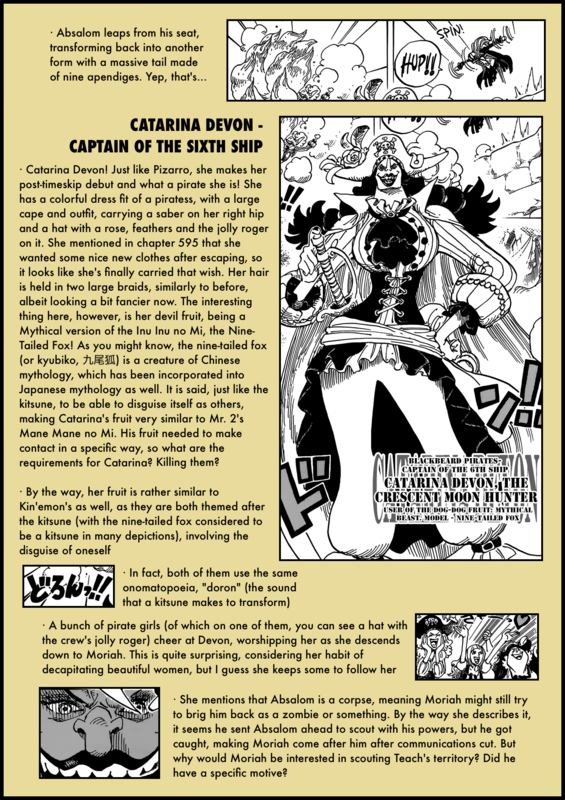 This chapter is filled with so many mindblowing things, from pirate references, to insane reveals and fascinating designs! Let’s get down to breaking it down! Yarr!! It is always a pleasure to read your analysis, thank you! Thanks for the review, Arthur. Great job as usual. I’d like to read/what (in youtube maybe) a nice Kabuki play. Do you have a recommendation about it? 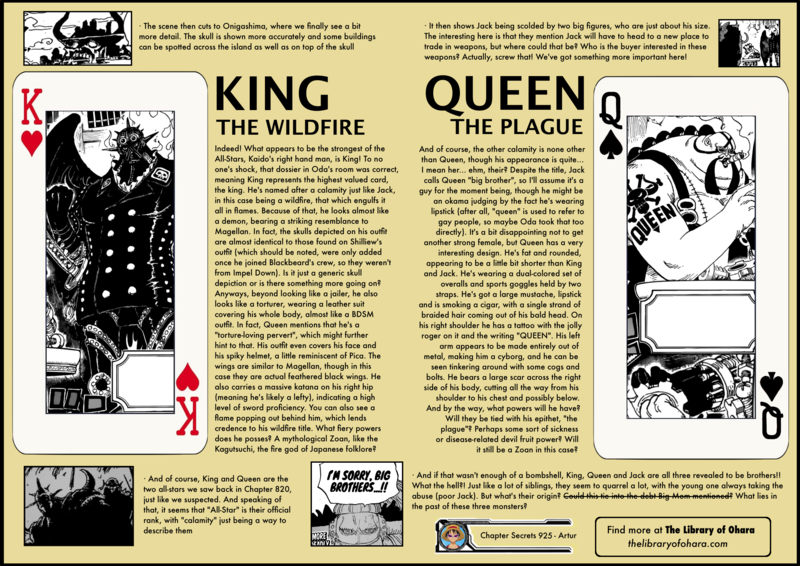 About Queen and King, actually when I read the chapter it was Queen who gave me the BSDM vibe, because it seems he’s playing with some pieces of Kid’s arm. King is a mix between Pica and Gladius. 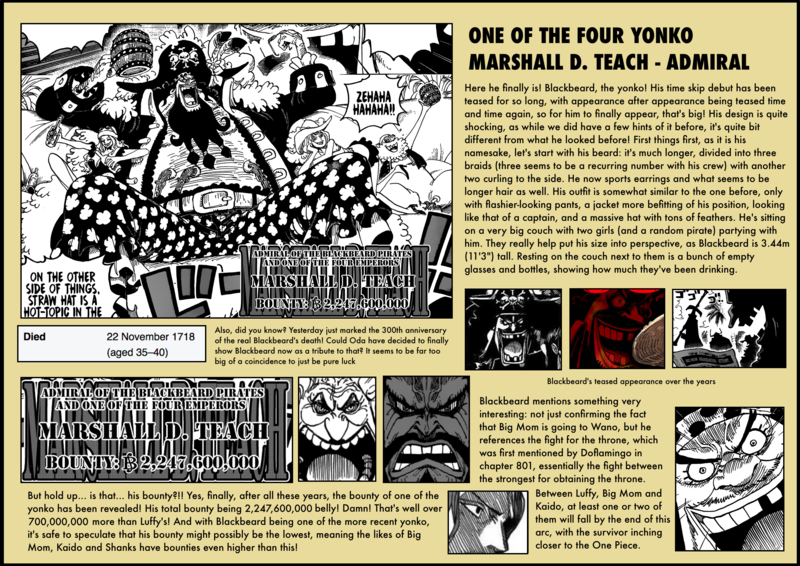 It’s a shame Oda offpanel great battles, like Law vs Fuji vs Dofly… But I guess it’d be hard to draw all of that. It’s a long shot but I could accept that BigMom and Kaido have 6 sons, and each one keep three after parting ways. Also, that random pirate next to Blackbeard looks like Smee, from Peter Pan. Yeah, that could perhaps tie into the debt Kaido owes her. Could also explain why both Katakuri and Jack have sharp teeth. I thought the same about Smee, it totally reminds me of him! Mmm, how about Onigashima being Wano Country’s territory? Hey, great piece. I just wanted to add that there is actually a use of the word/sound “Ha” in actual shamisen music. I’m not the biggest expert on it, but it seems to be used for timing purposes; as in, timing the beginning of or parts of the song. This coincides with your analysis. Cheers! Blackbeard always had a terrible fashion sense when it came to trousers, didn’t he? It’s great to see Moria’s more human side and I’m interested in what direction his character will take. 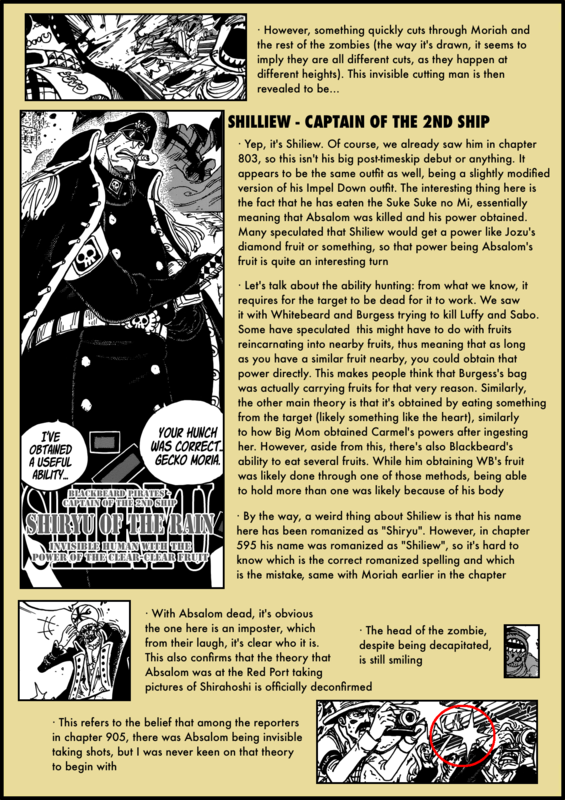 IIRC this is the first crewmate he’s lost since Kaido wiped out his original crew so while it may seem like a stretch, will he find a new “white whale” in Blackbeard after Kaido is taken down? I don’t think the topic about dissolution of shicibukai. The new shicibukai after time skip is useless then. Yes they are useless. Most of the original Shichibukai just kept being replaced anyway. We need to see what happens when they’re pirates again. 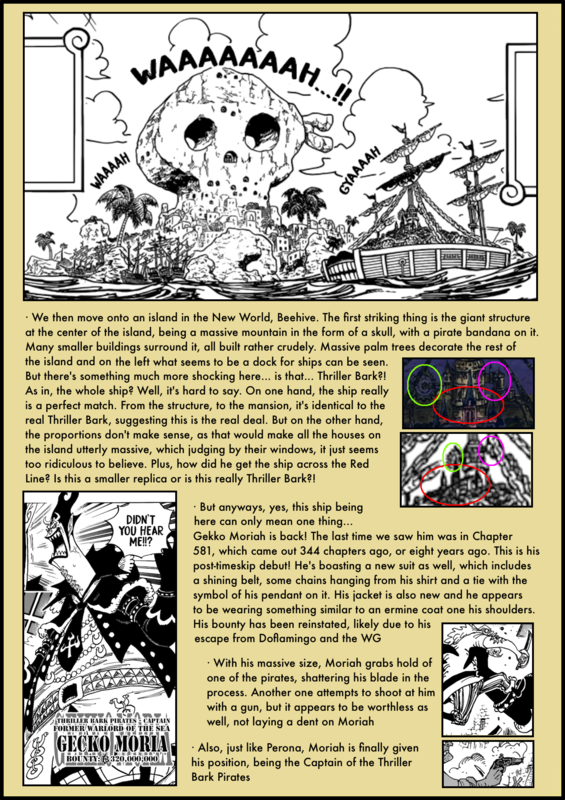 Hancock, Mihawk, Buggy, Weevil… who were the others I forget, we need to see consequences of the abolition of the Shichibukai. It would be stupid to being hyped by Fujitora about such thing and also learn Vegapunk had a better idea in mind than keeping the Shichibukai. For King, did nobody make the Yatagarasu connection? Seems pretty obvious to me. In Persona it is a fire-aspected beast. 2. I feel sorry for him, and even if its Moria, its kindda sad whats happening to him in the New Wolrd against a Yonkou, AGAIN. 6. This intro was THE PERFECT WAY to show us how cruel, sadist, careless AND POWERFUL are these guys, toying a former Shichi like nothing: THE BLACKBEARD PIRATES. 8. Teach intro, Teach looks, Teach bounty, Teach cruelsome, Teach crew, TEACH. 10. 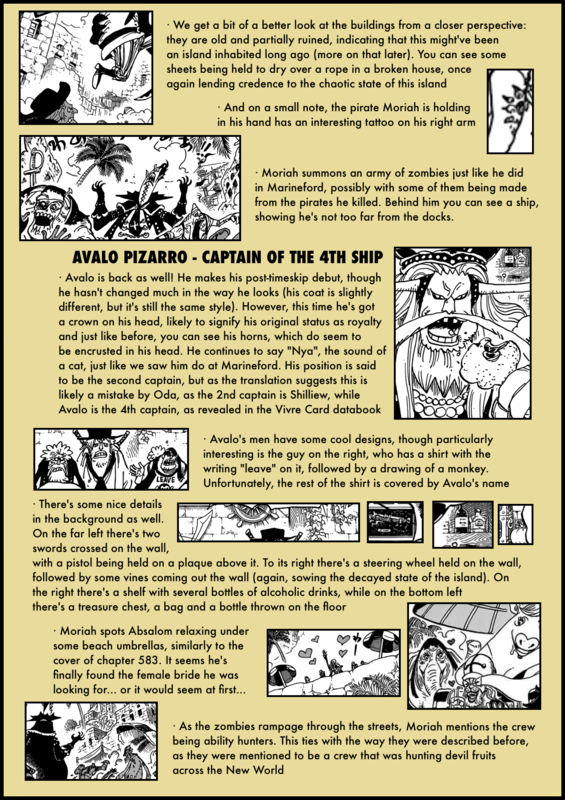 HUGE EVENT FORESHADOW, wonders if its the same foreshadowed when the Straw Hat Fleet was formed. 14. No Strawhats this cap? cant remember. Hey Arthur, huge fan of your reviews. 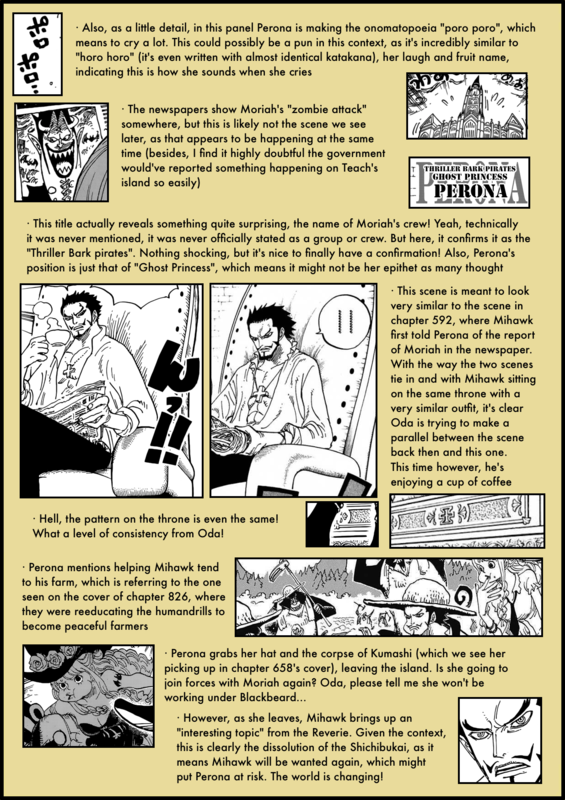 I was wondering about the glasses that Blackbeard is sporting. Some guy on Mangastream commented that they resembled those of Aokiji a lot and i have to agree with him. 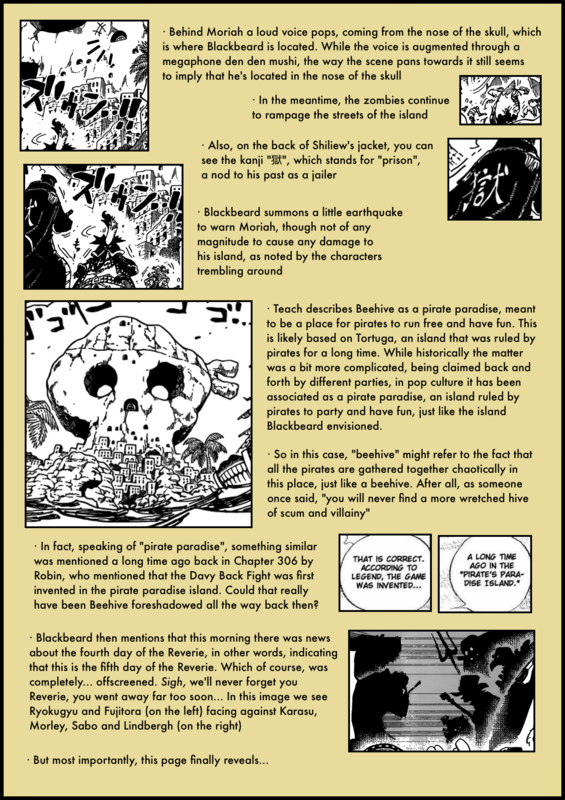 Not sure what it means that Blackbeard seems to have them now, but it’s definately a detail worth mentioning imo and i was curious why you didn’t comment on it. thanks as always for your excellent analysis. I nearly forgot that we haven’t met or heard about Moria for 8 years! 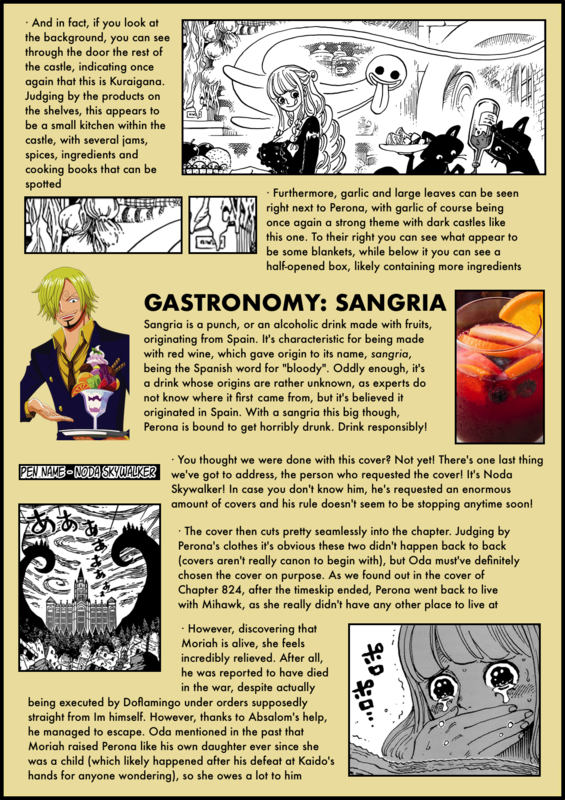 dude do u remember chapter 631 the cover page rom the decks of the world vol. 16 “Twin Cape” ?? we know crocus was the doctor on roger´s ship and we also know that oden and all his pals know roger´s crew. i think for a lot in the dudes that appears in oden castle that were kneel before oden’s wife that the one with the hat is the same that was with crocus. ¿u know more about it? 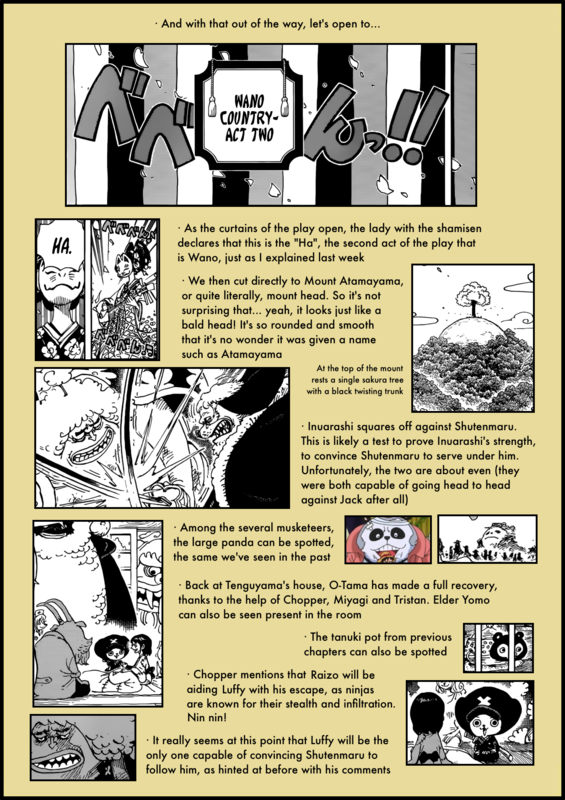 I’m really fascinated by how Oda does magic tricks with the numbers of the chapters, is there a place where It’s listed all of this awesomeness?